Another long-time MEAC basketball coach won’t be back on the same bench next season. Sources tell HBCU Gameday that Kevin Nickelberry is out as Howard’s basketball coach. According to the source, Nickelberry stepped down from the helm. Stadium also reported Nickelberry’s departure. 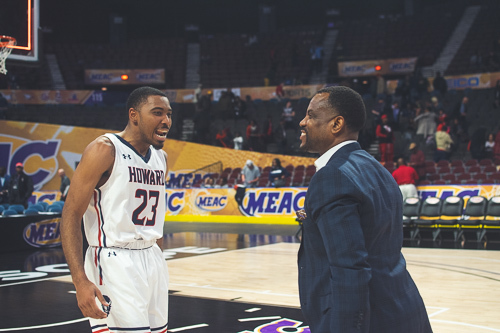 Nickelberry has been the head coach at Howard for nine seasons, compiling a 96-193 record during his time at HU. The team finished 17-16 during the 2018-19 season, his best at the school, ultimately bowing out of the MEAC semifinals to Norfolk State. The most memorable moment of his final season, however, was a Feb. brawl against Norfolk State that led to six players being suspended by the MEAC and Nickelberry being suspended by the school. Nickelberry’s departure would make three openings for MEAC coaches in-and-around Maryland. Long-time Morgan State coach Todd Bozeman’s contract isn’t being removed and Maryland-Eastern Shore is looking for a permanent head coach as well. Nickelberry, 54, coached three seasons at Hampton, going 49-44 before being let go by the former MEAC team. He resurfaced at its rival prior to the 2010-11 season. Despite being located in a basketball Mecca in Washington, DC, Howard basketball has struggled to consistently field good basketball teams. Besides a solid stretch in the 1970s and 80s under A.B. Williamson, the program has never been a powerhouse on the hardwood. The new coach will likely have to deal with many of the same issues that Nickelberry faced during his tenure, including a limited ability to acquire the type of JUCO and transfer talent that many low-to-mid level Divsion I schools thrive off of. Nickelberry’s successor, however, will inherit a talented team that boasts the MEAC’s top two scorers in RJ Cole and CJ Williams. That’s assuming both players decide to stick around.